Debra Hurd is quite the artist. Not to say that she’s really all that original, but I really like her Jazz painting series. It’s got a style that looks hurried and kind of blurry, and does a pretty good job of capturing what the performance is like. It’s a rush of action and you tend to focus way more on the music than on the people playing it. Here it’s almost like the musicians in the paintings are not the focus of the attention, which is somehow disconcerting because they’re really the only things in the painting to begin with. A bunch of her paintings are for sale through her website, so check ’em out if you’ve got some money to spend. Christian Marclay is a particular strange and, I think, incredible artist. He obviously uses a pretty wide variety of materials but in the documentary below, his focus is mainly on turntables and vinyl. What could be more in keeping for 4080? Nothing! Check out the video below to get a sense of his work. Marclay is quite the character. He started off in playing music in the punk rock era. Wikipedia suggests his inspiration came from using a skipping turntable to fill in for a missing drummer (the skips being used as percussion). I think my favourite thing that he’s done (as you’ve seen in the video), is the way he cuts and rejoins thrift-store records. It creates a whole new sound out of old vinyl, and may mean some interesting combinations. Obviously harming any records (as you also saw in the video, with his little vinyl snapping ensemble) is not a thing we’re endorsing, but you have to admit some of the sounds he’s come up with are pretty intriguing. Overall I’d say it’s his use of a traditional music form in brave new ways that draws me in the most. He’s really exploring new uses for vinyl and for a turntable, in a way that is supposed to encourage thought. I’m not saying he’s entirely succeeding, but he’s also not doing terribly either. The New York Times is reporting that Big Boi (of Outkast fame) has decided to collaborate with the Atlanta Ballet Company to produce an interesting mixed show that combines hip hop and ballet. Mr. Patton and the Atlanta Ballet say they are seeking to expand the horizons of their respective forms, without compromising them. It’s a tall order, and it comes as ballet companies and the hip-hop industry are casting about (not always gracefully) for new directions and new audiences. I think they’ve taken a really good approach to this too. Instead of trying to adapt the ballet to more traditional hip hop style, they’re letting them retain a lot of artistic freedom. The dancers will do whatever their choreographer comes up with, while Big Boi and other artists wind in between them while performing. This is beneficial to both the artists and the ballet company. First, Ballet companies and other supposedly high society artsy endeavours often struggle to connect with the common people. They suffer from the misconception just helped spread that they are snooty. Introducing new ways to be relevant to society (especially the local community) will be a huge benefit to them and will hopefully enable them to maintain production. Second, for Big Boi this is yet another notch on his belt of accomplishments. He’s already helped create some of the most original hip hop in the past decade, and he’s also pushed cinematic boundaries with Idlewild. Doing this collaborative ballet, especially if done well, will do much to increase his already stellar reputation. This may also lead to more performances like this across the country, and if nothing else may expand hip hop’s appeal to a whole new audience. Professor Dyson, echoing several young Atlanta artists who weighed in on the project, sees in “big” an opportunity for hip-hop to re-examine some of its more self-destructive tendencies, including violence and “the blitzkrieg of misogyny that passes for commentary on gender.” If anyone could get hip-hop to open up, he said, it would be one of the adventurous stars of OutKast. It’s an interesting thought, that involving hip hop in a female-dominated, higher brow art form could do something to address some of the inherent problems within the art. To see a small video about the performance, click here. For pictures of dope grafitti/street art from around BC, definitely check out http://www.bcgraffiti.com/. I particulary dig this site because it features graf from places outside Vancouver. For Victoria heads, check out the numerous tags by local legends Pesto and Opie. Improv Everywhere is pretty much exactly what it sounds like. It’s sort of like those flash mobs that were all the rage a few years ago, except they occur with a little bit of planning. Improv Everywhere causes scenes of chaos and joy in public places. Created in August of 2001 by Charlie Todd, Improv Everywhere has executed over 70 missions involving thousands of undercover agents. The group is based in New York City. It’s actually kind of incredible to see these random missions. Most of them get a pretty positive response from the public. The Grand Central one in particular really seemed to absorb a lot of people, who just couldn’t figure out why someone would do something like this, or even what they were doing at all! This is an awesome project from a pretty unlikely source. As far as men’s magazines go, I’m sure Esquire ranks somewhere up there in terms of class, but that’s not exactly saying too much. Anyways, they decided to go out and do something artistic! Esquire went ahead and mailed out hundreds of napkins to writers all across America and asked them to write a short story on it and return them. About 100 stories actually came back and some of them are pretty good. It’s amazing to think that these people managed to cram a full story into such a small space. It just goes to show that maybe quantity isn’t everything when it comes to writing, and that the bigger the book doesn’t mean the better. You should definitely check it out, some of these stories will blow your mind, others will not so much. If nothing else maybe it’ll give you something to do the next time you’re sitting at the bar with some time on your hands. So this guy, Juan Francisco Casas, is a ridiculous artist. His new thing is that he draws these increrdibly elaborate portraits. They look EXACTLY like photographs to me, but apparently they’re actually hand drawn. 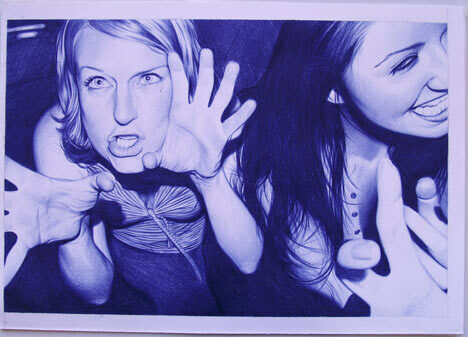 And they just so happen to be drawn with ballpoint pen of all things. Forgive me for being incredulous, but this is just ridiculous. It puts all my years of classroom doodling to shame. While I was drawing stick figures of that girl I liked, this guy was impressing her with a portrait so detailed it’s better than photos my old digicam used to take. Click on the photo below to check out the news article.